Book review: Manuale Calligraphicum. Examples of Calligraphy by Students of Hermann Zapf, David Pankow, ed. 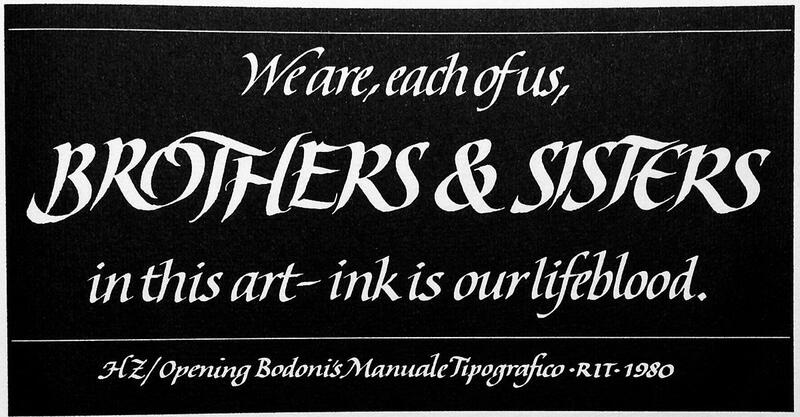 Manuale Calligraphicum. Examples of Calligraphy by Students of Hermann Zapf, David Pankow, ed. RIT Cary Graphic Arts Collection; Rochester, 2016, 60pp, ill. Hardcover, paper over boards with vellum spine. US$195.00. 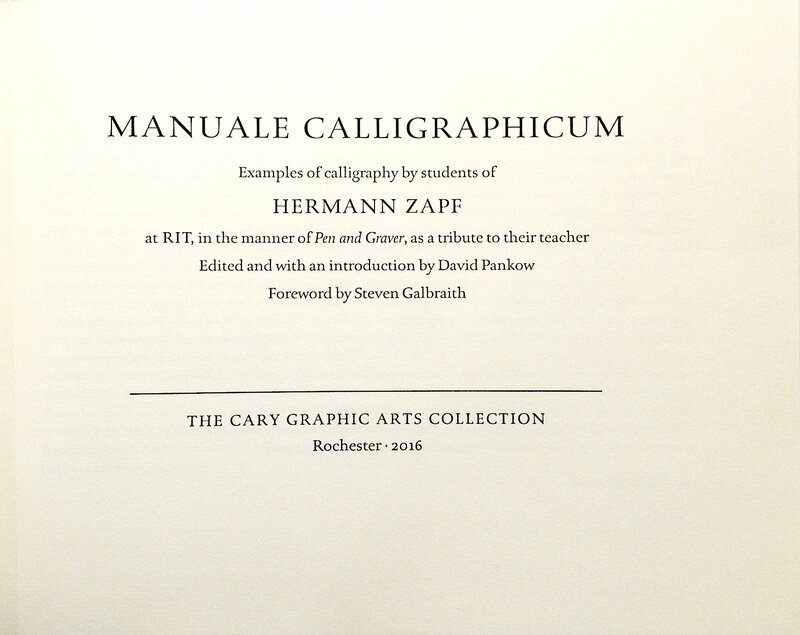 For ten years, from 1979 to 1988, Hermann Zapf taught summer master classes on calligraphy at the Rochester Institute of Technology. This book is a tribute to him by his former students. It contains nineteen specimens—or, rather, nineteen pieces of calligraphy art by Larry and Marsha Brady, Annie Cicale, Rick Cusick, Claude Dieterich A., Reggie Ezell, Peter Fraterdeus, Kris Holmes, Jerry Kelly, Peter Noth, Marcy Robinson, Ina Saltz, Steven Skaggs, John Stevens and Julian Waters. 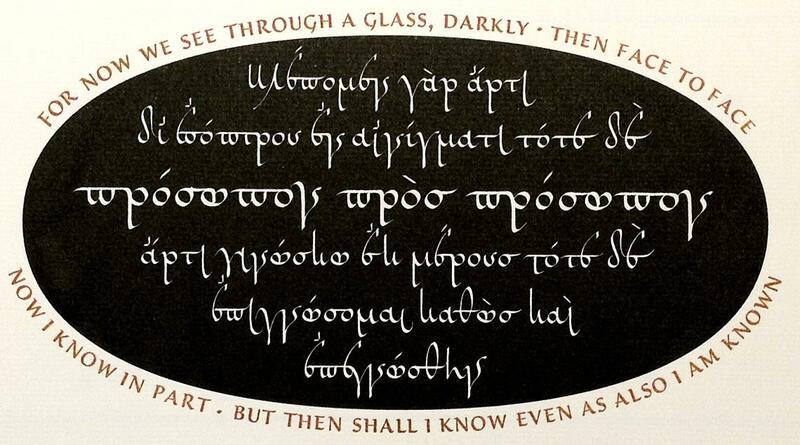 A TeX user probably knows some of these names from DEK’s 3:16 Bible Texts Illuminated, and, of course, from the Lucida fonts by Bigelow and Holmes. However, I would argue that calligraphy by itself is important for anybody interested in the philosophy behind TeX and METAFONT. One of the origins of our letters is the art of scribes, who for centuries developed the technique of combining legibility and beauty using pen and ink (another being the stone cutters making the monumental inscriptions). A careful study of calligraphy helps open the world of good typesetting—and is enjoyable in itself. Besides the illustrations the book has an introduction by David Pankow, a foreword by RIT Cary Graphic Arts Collection curator Steven Galbright, and artists’ biographical sketches. It was designed by renowned typographer Jerry Kelly. The spartan title page and Kelly’s Rilke typeface of the text contribute to the general impression of a tasteful book. It is printed on a letter press by Bradley Hutchinson on Hahnemühle paper with vellum spine in 325 copies. The book was designed as a luxury item, thus its rather steep price. Still, since the Web version of this review is going to appear before 2016 holiday season, it might give you a gift idea for a calligraphy lover dear to you. On the other hand, I wonder whether RIT Cary Graphic Arts Collection might consider a trade edition of this book: it might benefit many students of calligraphy and fonts.